The nascent Great Western Railway’s first engines were a motley selection, sourced from a variety of manufacturers, their design and performance not assisted by the somewhat stringent conditions imposed by Brunel during the tendering process. Nevertheless, most of them were made to work by his brilliant young locomotive superintendent, Daniel Gooch. Following on from these came the GWR’s first class of engines as such, the ‘Stars’, built by Robert Stephenson & Co. From these many lessons were to be learned, that stood the company in good stead when Gooch started designing engines for the GWR in the early 1840s. Part 1 begins the story of the GWR’s broad gauge fleet of engines by looking at the design, construction and life of these early machines, starting with those locomotives supplied for the opening of their main line between Paddington and Maidenhead in the early summer of 1838. There then follows a detailed study of the ‘Star’ Class, one of which, North Star, was to enter the annals of GWR history. 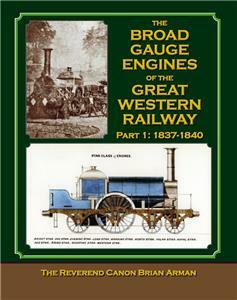 To complete this first part of the story, detailed appendices present the relevant GWR chapters from Wood’s A Practical Treatise on Rail-Roads (1838) and Wishaw’s The Railway’s of Great Britain and Ireland (1840), including the seminal section on practical experiments, which gauged the performance of various GWR engines in service over several months in late 1839/early 1840. Brian Arman has spent decades researching the engines of the broad gauge and has sourced numerous rare drawings, photographs and plans with which to illustrate the text. As the editor for many years of the Broad Gauge Society’s journal, The Broadsheet, he has been in a unique position to gather much of this material. Inevitably there are large gaps in what is known, most of which will probably now never be filled, but for the first time all that is known and has been found is here brought together in Part 1 of this planned series.